O!Bleak O!Blog | Secondlife O!Bleak Boutique! Haven’t posted since May 1st.. Sometimes real life just gets you in its hold and keeps you away from doing stuff like this..
First and foremost we have MOVED! You can find our store at our new location – HERE! 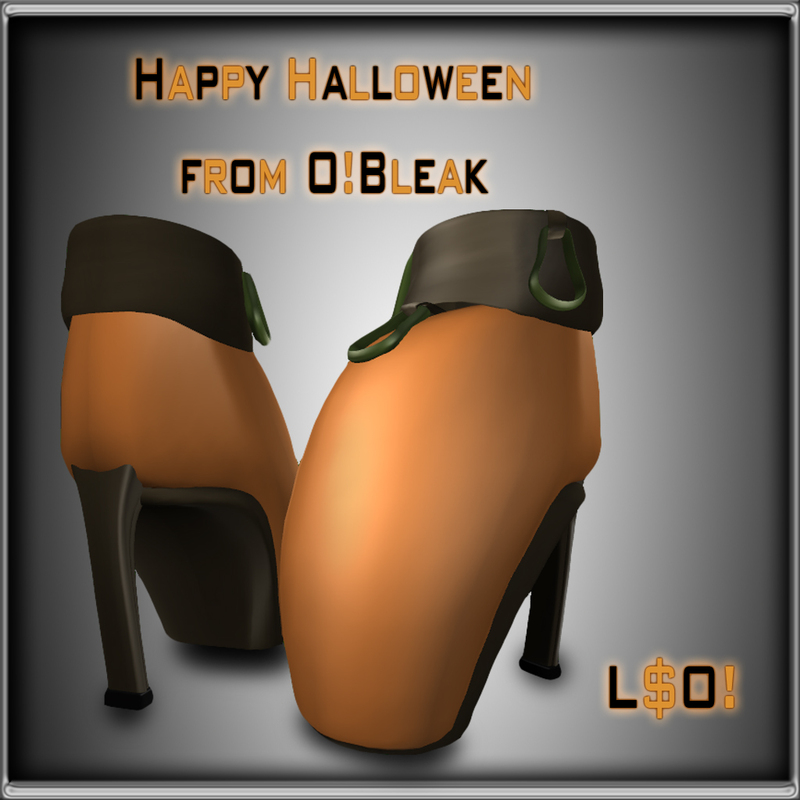 O!Bleak is part of the Halloween Spooktacular at Atomic Island! If you have not been there yet, I do suggest stopping by! O!Bleak – Indian Summer Skirts – Short, Full Skirt, and Long Red. L$ 200, ea. Been awhile since I’ve posted here, but I have a new release that you should all come check out! Zipper Glasses are sure to wow everyone if you sport them around, you fashionista! Late post on what I released this morning (Sorry busy day!) 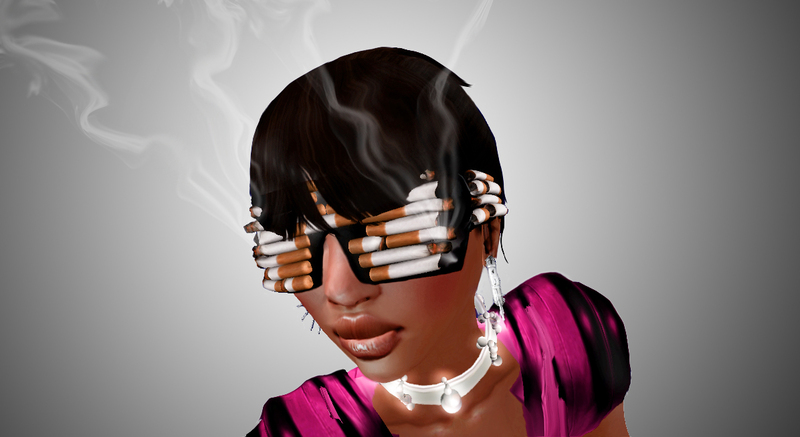 is the Lady Gaga Cigarette glasses from her new video Telephone. The glasses were made in 3DS Max, feature baked lighting, bump mapping, and are completely 100% sculpted. Did I mention they come with three cigarettes you can also place in your mouth? Check out the picture to see what they look like! O! Bleak now has two items out for Super Bargain Saturday! 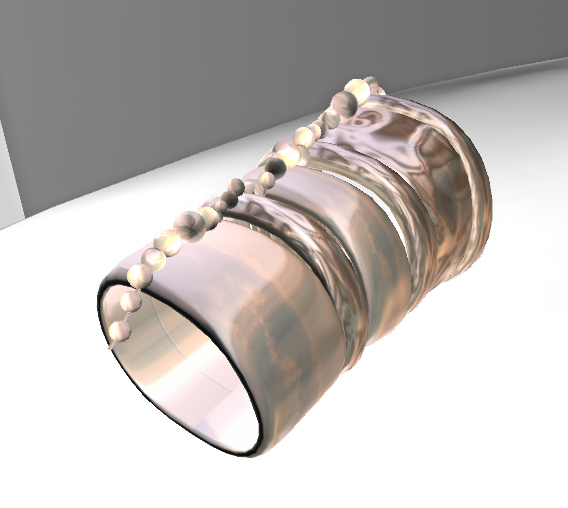 The first is a nice bangle, and if that’s not your cup of tea, the second are some Rock Candy Betty Shoes. You can see both of them below, or swing by O! Bleak to check them out in world! Botmodel 9000 in O!Bleak Store! That’s right, we have our own model / bot in the store on a pose stand modeling some of our accessories! If you’re feeling a bit lonely while you shop, or just want to have a conversation drop Creamy Sorbet an IM and talk about whatever you want. Sometimes it gets interesting, you can even ask her questions about me! She does look pretty nice, doesn’t she? By the way, we are working hard to put out our new horns, check out for updates soon! Holy (or unholy) new stuff in the works! That’s right ladies and gents, you heard it here first! The one and only Miss Dotty Latte is working her round rump off making us all delectable new accessories to jazz up our virtual selves. What kind you say? Well, don’t tell her that it was these loose lips that told you, but first up is a very unique pair of couture horns that are dripping with the tears of an angel. What I cannot tell you is how she aquired said tears! There are also some perfectly placed feathers plucked right from that same poor angel’s wings. The poor dear. It’s a good thing they were put to good use. Actually, make that divine use! Oh, and there is more! So much more! Including some really gorgeousAlice in Wonderland inspired baubles that you won’t want miss. Untill next time, happy shopping! Weekend Fever is no more according to a group notice sent out by Gyorgyna Larnia. I’m really sorry to announce that this week has been the last for this event…new things are coming…better people to work with, better items to come, and more smiles. As a designer being a part of the Weekend Fever group I was saddened by this, however I can understand that one person cannot keep a group going alone. I will miss it, as it brought a lot of attention I would have otherwise not have gotten, and met a lot of people I probably would have not. Hopefully something new will come to light, it seems there is a prelude within the message. Just maybe? The O!Bleak Blog is now active and running. It’s a bit bare at the moment, however I will be adding more content related to the store and Secondlife soon. Please check back frequently or subscribe to my store’s RSS feed in world here! As you can see I have the RSS feed up and running so you should be getting the updates in this blog as well as in world, nifty eh? There is also a few other neat widgets over there. Above you can find a few pages, about, and new stuff, I will usually post the new items under the new stuff, as well as on the main page. However it can be cluttered with news about the store, etcetera.